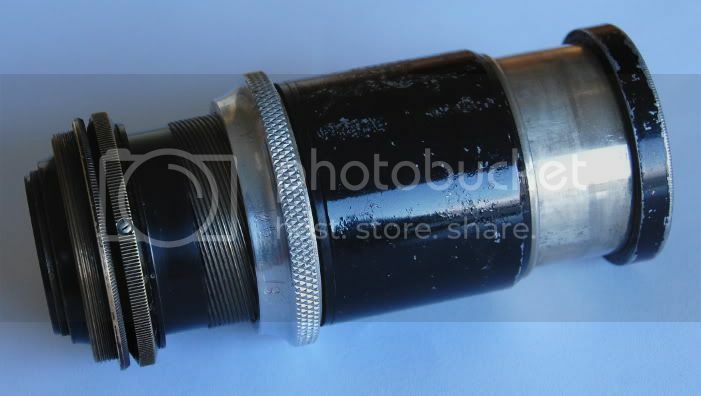 What we have here is a J. H. Dallmeyer "Adon", a lens which could be used either as a front-mounted teleconverter, or as a standalone telephoto lens. The Lens Collector's Vade Mecum (07/05/2001 edition) references several versions of the "Adon" being sold from 1891 through the 1950s, with this version being made perhaps from 1927 through ~1939. The distinguishing factors are that this is later than the rack-and-pinion versions, has an extending front, has a helical adjust in the center, and is not the "New Large Adon". Presumably, this model can be referred to as the "Type 111 Adon Adjustable" ("111" meaning "3"). By the engravings, mine is serial number 142148, and was made in London. 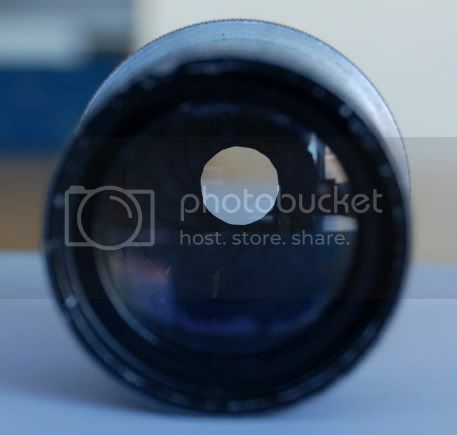 The lens has four elements, two in the front and two in the rear, with the aperture located about a third of the way from the rear elements. Some further research has found a catalog at Camera Eccentric, with "1931" hand-written on the cover. A huge thanks goes out to the folks at Camera Eccentric, they provide a truly amazing resource for these old lenses. 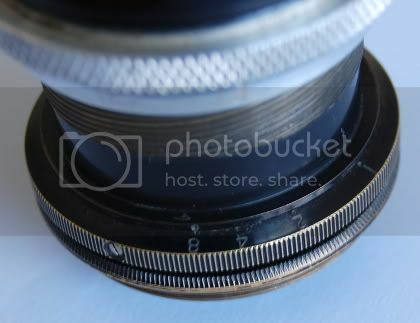 The aperture has 14 blades, and a noticeable amount of grease. 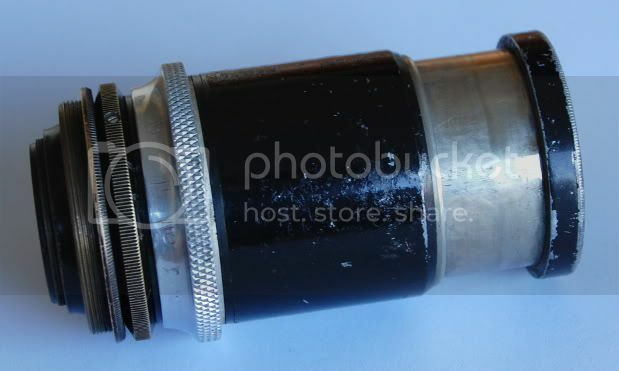 Here we can see the lens with the front group tube extended. There are no threads or mechanisms to this, it just pulls straight out. It is just tight enough in the outer barrel that you can leave it in any intermediate position and it will stay put. 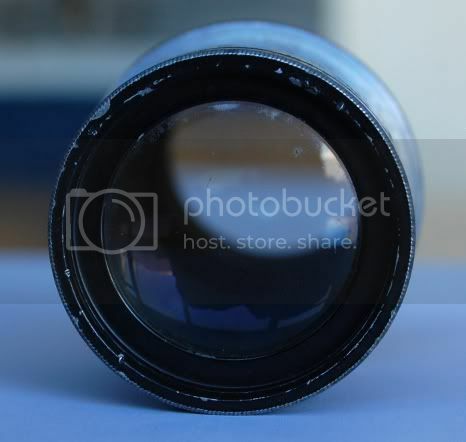 Here is the lens with the helical focus extended all the way. 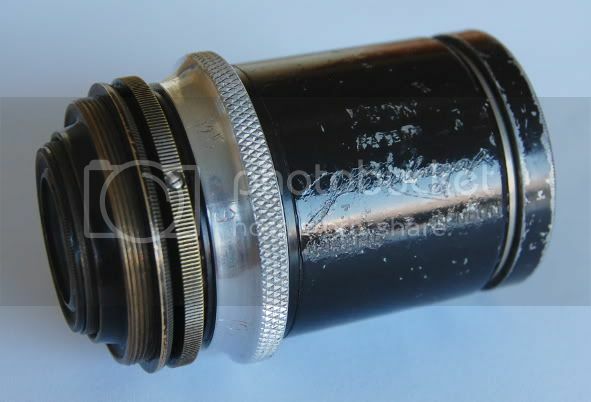 The aluminum focus ring has lines & numbers scratched into it, with markings of 2, 2.5, 3, 5, "h"? (probably "7"), and 10. This ring makes 1 1/4 turns to go from collapsed to extended, so I am not quite sure what these markings indicated? The aperture is stepless, and has markings for 1, 2, 4, and 8, with 1 being fully open. Again, I am unsure of the meanings of these markings. 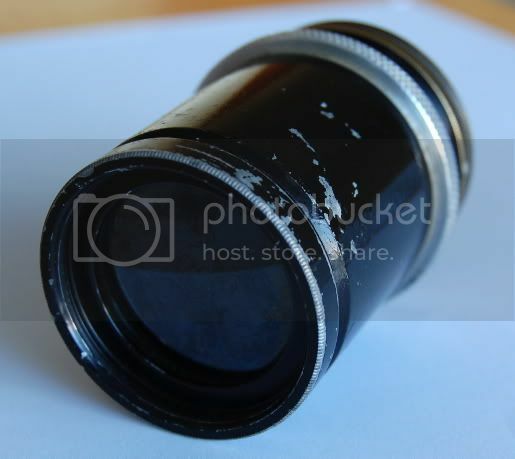 In the rear, the lens actually has two threaded mounts. 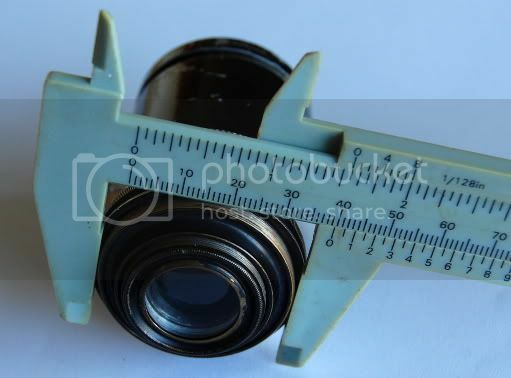 The first is very small, and would seem to coincide with the "1.1 inch" mount referenced in the catalog. The threads on this part are very fine, and the amount of tube exposed is quite short. The larger is just a touch too large for my M39 adapter, and of a finer thread pitch. It almost looks like this larger thread is an adapter, although it is either stuck, or not intended to be removed. It perfectly matches the rest of the lens in material & design, so I assume it was original or factory made. Not quite sure what I will do with this one yet, but the adjustable front tube shows promise of reducing the amount of extension tube I will need behind it. Probably you could try using M42 adapter instead of the M39? Nice lens ! So basically it is like a push pull zoom kind ? I tried it with a M42 adapter, but there is a huge amount of empty space around it - so it's not at all going to hold the lens. It's sort of like a push-pull zoom, but not quite.. Both the pull-out extension and the helicoid adjust the same thing - lengthening or shortening the same empty tube between the two sets of lenses. I think they gave it both the helicoid and the extension as a way to make it compact, easy to focus, and adjustable over a broader range to accommodate different cameras behind it. When holding it up to a piece of paper, it becomes obvious that the tube length adjustments don't really "zoom", they just change the point at which the lens focuses. So if you had a long set of bellows behind this lens, then yes, you could "zoom in" by adjusting the lens to move the focus point further back, then extending the bellows to bring it back into focus. 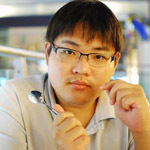 But alternately, you could lock the distance between the film and the lens (such as by using fixed-length extension tubes instead of bellows), and just use the lens adjustment to focus. Thanks, I had forgotten to check there! They do in fact have an ad for the Adon, but it is for the earlier version with the rack & pinion focusing. Camera Eccentric has a 1920's Dallmeyer catalog which also shows the same lens as your link, so it looks like the first version stuck around for a while. Yes Scheimpflug, thanks for the detail explainations. Look forward to your photos from this lens.